Riley Mumbling to Himself at Night, 1961-63. 56 3/4" x 66 1/2". The earliest work in the exhibition is actually a painting of 1961-63 called Riley Mumbling to Himself at Night, a title for which I haven't been able to discover the meaning but which suits the narrative indeterminacy of the work and (as students of mine pointed out) probably has sexual overtones. 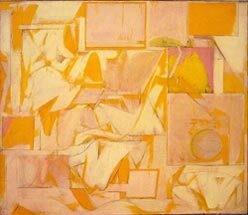 DeKooning appears to be the model. In a range of yellows and pinks, abstracted organic shapes--naked homuncular forms--elide or connect an ultimately rather distinctive pattern of rectangles, sort of like a dream or simply the constant perception of a reality, or the reality, in which those elements--organic and geometric--collide, or rather, coexist. This impossible conjunction remained the theme of his work throughout, even as the organic became more ethereal and the geometric more ambiguous later on. In another work, an untitled drawing of 1965, what seems like two diverging, perfect flumes of transparent rust-mixed medium, emerge within an outlined rectangle, as though the painter's movements were being born within the geometric shape. The force of life, of birth, is always evident, as is its context, and there is a constant shifting between them, "a kind of movement that has deeply psychological overtones -- with the suggestion of approaching, engaging, or entering the personal space of an other(s)," as Deborah Everett wrote in her perceptive review of October 2000. 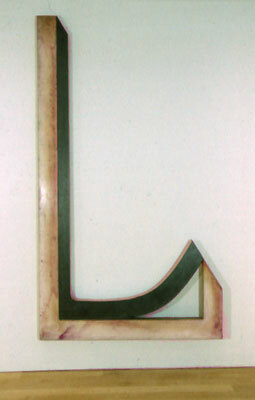 107 1/2" x 60 3/4". Movement takes the form of a curve, subtle change along a continuum, in early drawings and shaped canvases from the late 1960s through the early 1980s. Paleologue of 1969 brings together a prefix and a suffix in its title ("ancient discourse") which also, in its inverted, singular interlocking, describes the juxtaposition of two very different but similar elements--that is, they are shaped somewhat the same, are the same size, and fit snuggly one to the other, but there are divergences in that one is dark and one is light, one is solid in color the other mottled, perhaps more erratic and handmade, one is narrower than the other, and one curves up at the end, though it joins again with the other at the end flush in the same angle, pointing to the top. Quaytman has discovered some natural law to which very different parts of the universe, or our experience, conform, and it is quite startling, because it could not have been predicted; it could only be innerly determined. Quaytman understands that the relationships exist perforce among the oddest phenomena, and he is unafraid to explore them. We might know all the rules, but they would never be enough to encompass all that would need to be encompassed. That is the privilege and the distinction of the artist, for the moment. 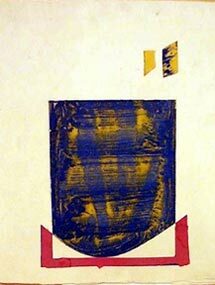 A series of untitled paintings-drawings of about 1973-74 leads up to another incredible series of large shaped canvases. One of them has a vertical rectangle painted in dark brown acrylics that seem forcefully rolled on, with a rounded bottom so that this dark, mottled shape seems to rock and balance on an overturned pedestal in the form of a red outline. Were the red to be continued around the rectangle and the bottom of the rectangle to be filled in, the result would be a repulsive, static image. Instead, they touch one another in ways they can exist together. Sine Nomine Singer of 1974, one of the large shaped canvases in this series (which unfotunately can't be illustrated here), literally has a rocking rectangle balanced on an overturned pedestal. The rectangle is heavily worked with deep blue paint, and yet it balances perfectly and lightly on its base. The title (I am guessing) means "nameless singer," and there is a quality of breathing and sound that seems to rise within the canvas in bubbles and strokes from within the depths of the blue painting, in blue space, so that the base has no trouble carrying it. It is both resounding and ethereal, perhaps, anonymously, the sound of the universe itself. 13 1/4" x 10 1/2", 33.7 x 26.7 cm. 28" x 28", 71.1 x 71.1 cms. Past the early 1990s, there are no more curves, perhaps because they are simply still there, without being depicted . Most of the works are cruciform in some manner, either in the shape of crosses or rectangles with crosses within them; everything has been subsumed into straight lines and right angles, the sine qua non of a picture. When confronted by the picture, the first impulse is to figure out where one is in relation to the spaces and shapes that are articulated. In Quantifire of 1989, for instance, the cross of rust dominates. It is a cross in which the vertical is definitely on top of the horizontal, not a single configuration that melds in the center. Yet it's not certain either that the horizontal is behind the vertical. It could be that they are at the same level and that the arms of the cross are actually separate rectangles. But the cross itself is a living presence, the rust signifying it as a quantifier of change and setting it apart from that which is simply, starkly black and white, but, of course, the rust contains echoes of black in its depths and of white in its glow of light. Symmetry, of the cross, the square, and the black border, is also defeated by everything else. 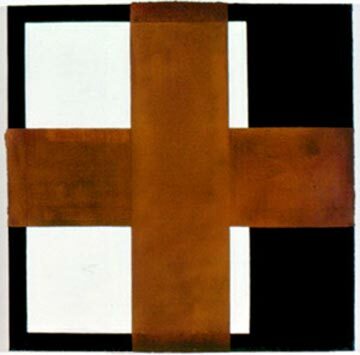 Geometric expectations prompted by the cross, the square of the canvas, and the two attendant squares of white in the left half, are contradicted by the introduction of white on the right and the unsquareness of all the other rectangles. There is no real way of knowing what the spatial illusion might be or indeed if there is any spatial illusion, so that in a sense everything seems to exist on the same plane. Everything is being and everything is nonbeing. The exhibition was shown at McKee Gallery, 745 Fifth Avenue, New York, NY 10151.